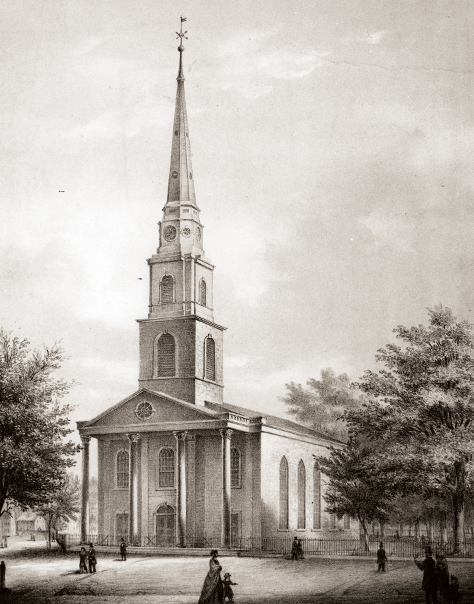 The second steeple to pierce the colonial sky over Newark was Trinity Church, now Trinity/St. Philip's Cathedral. Today, as we celebrate its 250th anniversary, we pause to acknowledge not only its religious importance but also its historical significance. Trinity was, and is, one of the very finest buildings along the length of Broad Street, the 'widest street in all of colonial America.' While Newark was settled in 1666 as a Puritan theocracy, in 1701 the Church of England's missionary branch, the Society for the Propagation of the Gospel in Foreign Parts, arrived in Elizabethtown. The Rev. Mr. Brooks served not only Elizabethtown but also Essex and Morris counties. As a result, some Newarkers were using the Book of Common Prayer as early as 1729. In 1746, a charter was granted by King George II, and the first rector, the Rev. Isaac Browne, arrived to minister to the parish. Browne, a Connecticut Yankee, was ordained in England in 1723. He spent 29 years here in town, but like other Loyalists was forced to flee in 1776 as a patriot victory loomed. During Browne's Newark days, he was a well-known and much-liked Newarker serving also as a trustee of the old Newark Academy and as a member of the New Jersey Medical Society. In his lifetime he was as loyal to Good King George as his rival, the Rev. Alexander MacWhorter, was faithful to his dear friend George Washington. Late in 1776 Browne and his wife 'removed' to New York where they 'were refugees behind Loyalist lines,' while back in Newark their personal property fell into the hands of 'the Newark rebels. 'During the military conflict, Trinity was used as a hospital by Loyalists and Patriots alike and as a gymnasium by Continental Army soldiers, who built chimney pots in the church nave. Soon after the construction of the present church building, attention was paid to the founding of other Episcopal churches in and around Newark. In 1886, the Diocese of Newark was created, but with the coming of the 20th century, many of the old families had moved out of town. With the rise of a great industrial city, Workmen's Clubs were established and new activities were designed to meet the needs of a changed parish. By 1910, Trinity House was completed, and in 1941 Cathedral House came into existence. In May 1944, the Rev. Arthur C. Litchenberger was installed as Dean in preparation for cathedral status, and the old charter granted by George II was replaced by a legal document crafted by the state legislature. In October 1966, Bishop Leland Stark and Father Louis Berry presided over the merger of the Cathedral and Trinity/St. Philip's, the Episcopal Cathedral of the Diocese of Newark. Two hundred and fifty years ago, an observer noted that 'sheep grazed at its door, and while the pastor fed his flock within, the shepherd tended his without.' While the shepherd of old is gone, the work within continues.